Meet Blade, A Double Amputee Athlete. So…who’s a guy named Blade? If you haven’t seen him on the London track yet, be sure to take the time to tune in. From Sunday, you all know I’m in love with the stories and the energy of these games, teams and athletes…but this story. This can capture us all. 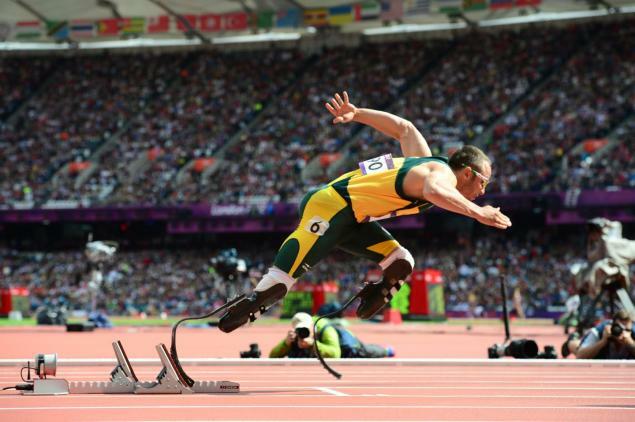 Known as Blade or the fastest man without legs, Oscar Pictiouris had his legs amputated at 11 months old because of a genetic disorder called fibular hemimelia (congenital absence of the fibula) in both legs. Oscar has fought much adversity and unfortunately did not qualify for the Beijing Olympics representing his county South Africa, but did not give up hope. In the 2008 Paralympics, Oscar won three gold medals and then in 2011 qualified for the 2012 London Olympics with the South America team and as the first double amputee athlete to compete in the Olympic Games. Pictiouris will compete this week with the South American team in the 400 metres and the 4 × 400 metres relay races. No matter what country you are from, this is an outstanding story of adversity. Congratulations to Oscar! Previous Post I have no time to be an Olympian.